also known as NGC 5264-HST. And if you had to ask, why did you have to ask me? You sent me like two million messages and comments and emails asking what I think about NGC 1052-DF2, that galaxy which supposedly doesn’t contain dark matter. Thanks. I am very flattered by your faith. This paragraph is decorated with two references, one of which is to Milgrom’s MOND and one is to Erik Verlinde’s emergent gravity. And, well, I’m a theorist. Therefore I can tell you right away those people don’t know a thing about the theories they try to falsify. It is beyond me why so many astrophysicists believe that modified gravity is somehow magically different from particle dark matter, or indeed all other theories we have ever heard of. It’s not. For both modified gravity and particle dark matter you have additional degrees of freedom (call them fields or call them particles) which need additional initial conditions. In a universe in which you have a large variety of initial conditions (seeded by quantum fluctuations), you will get a large variety of structures. Same thing for modified gravity as for particle dark matter. Another way to put this is that you can always cook up exceptions to the rule. The challenge isn’t to explain the exception. The challenge is to explain the rule. Modified gravity does that. Particle dark matter doesn’t. Of course you don’t see the exceptions in Milgrom’s or in Verlinde’s paper. The reason is that both merely contain equations which describe time-independent situations. These equations derived in Milgrom’s and Verlinde’s papers are not theories, they are certain limits of theories, approximations that work in some idealized circumstances, such as equilibrium. The full theories are various types of “modified gravity” and if you want to rule those out, you better find out what they predict first. But we don’t even have to stoop so low. Because, interestingly enough, the authors of the Nature study rule out MOND without even making a calculation for what that limit would predict. Stacy had to do it for them. And he found that MOND is largely compatible with the upper value of their supposed measurement results. Having said that, let us have a look at their data. So the galaxy in question is an “ultra-diffuse galaxy” with “globular clusters.” For all I can tell that means it’s a smear with dots. The idea is that you measure how fast the dots move. Then you estimate whether the visible mass suffices to explain the speed by which the dots move. If it does, you call that a galaxy without dark matter. Have I recently mentioned that I am not an astrophysicist? There are ten of the globular clusters, and here is the data. With the best-fit Gaussian. In case that looks a little underwhelming, some nice words must be added here about how remarkable an achievement it is to make such a difficult measurement and how brilliant these scientists are and so on. Still, ehm, that’s some way to fit data. And it’s not the only way to analyze the data. Indeed, they tried three different ways which gives the results 4.7 km/s, 8.4 km/s and 14.3 km/s. All I learn from this is that it’s not enough data to make reliable statistical estimates from. But then I’m a theorist. Michelle Collins, however, is an actual astrophysicist. She is also skeptical. She even went and applied two other methods to analyze the data and arrived at mean values of 12 +/-3 km/s or 11.5+/-4 km/s, which is well compatible with Stacy’s MOND estimate. Michelle also points out that globular clusters are often not good representatives to measure what is going on in a whole galaxy, because these clusters might have joined the galaxy at a late stage of formation. In other words, even those estimates might be totally wrong because the sample is skewed. When I factor all this information together, I arrive at a 95 percent probability that this supposedly dark-matter-less galaxy will turn out to contain dark matter after all and it will be well compatible with modified gravity. I give it an equally high probability that five years after the claim has been refuted, astrophysicists will still say modified gravity has been ruled out by it. 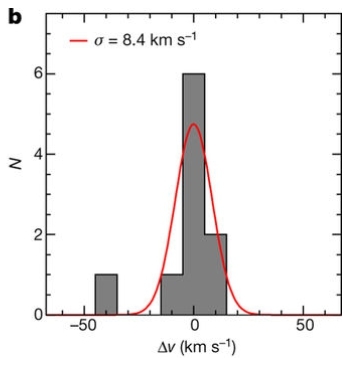 Like the Nature paper refers once again to the Bullet cluster but fails to mention that the Bullet cluster can well be explained with modified gravity, but is difficult to explain with particle dark matter. Maybe the editors at Nature should read what they recommend. Update April 11: The paper’s first author has some comments on the various points of criticism that have been raised here. Update April 16: Another paper on the arXiv today, this one showing that the observations aren’t in conflict with modified gravity: MOND and the dynamics of NGC1052-DF2. Er, because modified gravity could never be absent from a galaxy, but particle dark matter could be absent. How can there be an “exception to that rule”, as you put it? If a galaxy is ever found without dark matter, sorry, that’s the end of the line for modified gravity as a solution. Modified gravity adds fields to gravity and whether those fields result in (non-negligible) deviations from normal gravity depends on the initial values and on the dynamics of the full system. When you say "modified gravity could never be absent from a galaxy" you are confusing the theory with the effects of the theory. You could equally well say "the Lagrangian of particle dark matter is never absent from a galaxy" which makes equally little sense. Well, I really think that's pushing the definition of "modified gravity". Gravity applies to mass. It's not something you can turn off and on. Let me add a concrete example here, my currently favorite theory, which is the case where you add a field that forms a superfluid. This superfluid mimics dark matter in galaxies by dragging on the normal matter. It is a modification of gravity, not just dark matter, because the effect which we assign to dark matter does *not* come from the gravitational pull. It comes from an interaction with the new field. It's a bona-fide modification with a long-range interaction. But no one ever said that normal matter always has to sit in that superfluid to begin with. It can sit elsewhere and all by itself, just as it can do that in models with particle dark matter. Whether that happens or not depends on the initial conditions and the quirks of structure formation and so on. If you want to rule out one or the other model this way you'd have to run a simulation for the formation of galaxies and collect statistics for how likely or unlikely that is to happen. You can't just point at one galaxy and claim out of nowhere it's supposedly impossible. You don't "turn it off". I don't know what makes you think this. I am merely saying you actually have to look at a theory and make a calculation rather than jumping to conclusions from some limiting case (which we already know doesn't apply in general anyway). Well, fair enough. I don't think I'm alone, though, in thinking that "modified gravity" should just mean a modification to Einstein's equations based on some rationale - no extra field needed. Just modifying the gravitational field. If you start adding fields, as you say, that's basically the same as particle dark matter. No way to distinguish. There are theorems that say you cannot modify GR without adding extra fields. It is obvious to me, that as long as we do not know what dark matter is (if any) other options must be taken seriously. Given that we rely on science, not a belief system. I didn't coin the terminology and to some degree I agree that it isn't very helpful. The distinction between particle dark matter and modified gravity is really more a sociological divide than a mathematical one. But if someone claims to rule out modified gravity, then I think they should look at the literature to find out what is really meant by modified gravity, rather than commenting on what they believe it means. I once again recognize how misleading the naming MOND is. I myself dismissed this simply because I interpreted it (as the name suggests not only to me, obviously) that MOND simpy replaces the 1/r gravitational potential by some (fitted) modified potential - thus violating General Relativity etc. Only from your (and then Stacys) articles I learned, that constructing something like 'modified dynamics' from additional fields would/could be a specific version of MOND rather than Dark Matter. I assume, that several physicists would count such additional fields as some specific DM candidate. May be, the whole naming and interpretation should be given much more carefully and completely to avoid such misinterpretations - especially when hype is added to the confusion. MOND I thought referred to the idea that Newtonian gravity is modified at galactic length scales. This modification is ad hoc and not attributed to some additional (dark) fields. So what you are saying is that some dark fields also produce a similar modification of Newtonian gravity in which case we cannot rule one out without also ruling the other out. Am I right? MOND is as "wrong" as Newtonian gravity is "wrong". Both apply only in certain limiting cases. The MOND limit is even more restrictive than the limit for Newtonian gravity in that it's time-independent. There are various ways to complete MOND to a full-blown theory of modified gravity, from which you get back MOND in certain limiting cases. Milgrom himself has proposed several, so has John Moffat and some other people. As you notice, the completion isn't unique. Verlinde's approach is more akin MOND, in that it too is a limiting (non-relativistic, static case). The model I proposed is a completion of Verlinde's approach much like Moffat's is a completion of MOND. The point is whenever you want to test MOND or Verlinde's emergent gravity you first have to make sure that you are actually in the correct limit. Generally, whenever you have a reason to suspect a system isn't settled, it's a bad limit. Also see the comment by M_Malenfant. As an aside, MOND is not a modification at a particular length scale, but at a particular scale of acceleration. "Maybe the editors at Nature should read what they recommend." I like your strong stance against confirmation bias. Yes, I agree with you on the naming issue. Justin Khoury, for example, refers to his model as a type of dark matter. Yet, if you look at the relevant defining equation it's almost the same as Verlinde's who refers to it as a modification of gravity. On this particular item I side with Verlinde, for the reasons I explained above: In both Verlidne's and Khoury's approach the effect that we usually assign to dark matter is not caused by gravitational pull. It's instead a different type of force. So personally I think that's a way to distinguish the both cases. But in the end it's a matter of definition. I must say I've been confused by the term "Modified Gravity" too. Is there a term we should use for a theory that merely change equations for spacetime, rather than adding a field to it or adding invisible matter? Since fields are particle and particles are fields (as explained by the quantum theory of fields) I understand why the distinction is moot. Although one could imagine invisible matter made of particle we already know, but I guess this has been pretty much ruled out. The Tully-Fisher relation is everywhere and everywhen identical. Black holes and perhaps neutron stars trapping dark matter are ignored. If collisional detection is true, dark matter thermalizes over time. Observation would skew versus redshift, galaxy age, and matter density. Incremental angular momentum with radius is intrinsic, therefore "clever" without doing anything (no free parameters). Physics cannot source Milgrom acceleration, analytical chemistry can. Question your postulates with observation. "Consequently, the dark matter contribution is fully specified by that of the baryons. " 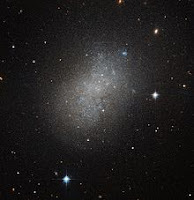 I too was going to pester you before finding Stacy's post: as a non-expert I was puzzled by the lack of greater coverage on NGC 1052-DF2 since it was supposed to give a strong demonstration of Dark Matter. Of course it did not, but I'm still unsure whether the lack of virality was due to people having wised up and thus expecting it was hype or to people just not taking alternatives to Dark Matter seriously a priori. I suppose it's the latter, though I'm not sure which would have been sadder. I take a bit of issue with the way you've described Figure 3. The red curve is not a fit -- it would obviously be a poor fit and trying to fit the data with such obviously ill-chosen binning would be ridiculous anyway. From the text and the caption I infer that the red curve represents a Gaussian with a width given by the "Biweight estimator" whatever that is. When I look at the data, I would argue that the 8.4 km/s dispersion is an overestimate driven by the one galaxy that is clearly an outlier. The larger numbers that are extracted make no sense to me as they clearly are driven by that outlier. The RMS is clearly problematic. I'm surprised that they didn't just do a proper Gaussian fit, but that's me being a silly particle physicist. Since I also am not an astrophysicist I have no experience with how they handle such outliers, but I suspect the paper overestimated, not underestimated the dispersion. Your point that even if the dispersion is small, it doesn't rule out modified gravity is interesting. And I agree with you if that means theories where the modifications arise from other fields. But that would maybe be a productive step forward if we could at least take off the table modified gravity proposals that don't involve additional fields. Of course we would need more/better data to really do that. I suspect I am getting confused. If I am following this properly, MOND includes an additional force that is independent of the presence of mass or the distance between the masses, and this force is not gravity. It is caused by something as yet undefined (at least to me) but the force acts on matter. On the other hand, dark matter is something proposed that we do not understand, and it exerts a gravitational effect on mass in galaxies. How much of that is wrong? I am also interested in theory (no experience in cosmology, though). My first thought on seeing this publication was, the basic problem I had with the dark matter hypothesis was that the amounts of dark matter in a galaxy should vary between galaxies, and when everyone was insisting it did not, that looked like a critical blow. So, in a sense, this observation fills a prediction of the dark matter proposition. That does not mean it proves it - it does not - but at least it seems to me that it relieves one of the major problems with dark matter. how would you classify Lee Smolin's proposal " MOND as a regime of quantum gravity" and " Four principles for quantum gravity"
Thank you Dr. H. Always a pleasure! You can modify GR without adding extra fields, but not at small curvature, that being the issue here. You can do all kinds of modifications with higher curvature terms or non-minimal couplings and so on and so forth, but they'll all reproduce GR at small curvature. Maybe "fit" isn't the right word here, but then what should I call it? It's almost always futile to try and change terminology. Let me also add that this discussion of field vs gravity is as old as GR itself. Einstein himself (if I recall correctly) sometimes favored interpreting GR as a theory of fields on spacetime rather than a theory of spacetime itself. Steven Weinberg in his GR book famously refuses to go into any geometric interpretation. This has the benefit of highlighting the similarities to QFTs. Having said that, as was mentioned above GR is unique with only mild assumptions. The only way to change it is to add fields. Whether or not you call that theory a modification of gravity depends on the way you interpret the fields. If you give them a geometric meaning, people tend to call it modified gravity. Brans-Dicke is the prime example. You can also add torsion and/or non-metricity, which you can reasonably interpret as gravitational in origin. But this distinction becomes murky quickly. Certain types of non-metricity, for example, basically add vector-fields to GR (it's called vector-nonmetricity). Other types you can rewrite as bi-metric theories and these are even harder to interpret: Are they gravitational because both fields are metrics or are they not because you have an additional field? And so it goes on. A somewhat cleaner separation is that in modified gravity the fields tend to be classical while in particle dark matter they're quantized. However, the classical limit may be a good approximation in some cases, notably if you have a condensate in the ground state and that seems to be the very case we're dealing at here. And of course you can always quantize the classical field, even though the effects of that may be non-observable. In any case, I hope that explains where this conflation comes from. Would you have any suggestion for a name other than "modified gravity"? No, I didn't know of Ethan's post before it appeared. MOND really is just an equation and what it does is, as the name says, to modify Newtonian dynamics. This modified force is sourced by normal (baryonic) masses. But you can of course always go and subtract from this MOND-force (or potential respectively) the normal gravitational force, and then go and assign the remainder to an additional force. You can even go further and assign that additional force to a "phantom dark matter" simply by integrating it. Indeed this is often done in the literature to make the comparison to particle dark matter easier. So this is why you can always rewrite "modified gravity" to "additional force" to "phantom dark matter". But, yes, what you say above is roughly right. In theories that give rise to MOND, the effect of the phantom dark matter is not produced by the (normal) gravitational pull of additional stuff. You can't see this very well on the level of a single equation, but you can tell if you have a full theory. This is not a distinction that is being made in the literature but I think it's a distinction that makes sense because this is ultimately the origin of the regularity that MOND can produce, but particle dark matter can't. Lee isn't so much trying to find a theory of modified gravity as trying to explain the origin of MOND which he thinks is due to quantum gravitational effects. That's an interesting connection to make (it's also the connection that Verlinde is trying to make) but on the level of the effective theory it doesn't really matter. It's kinda like asking where the Higgs comes from. Interesting question to think about but if all you want to do is making predictions for the LHC you don't really need to know the answer. Same with modified gravity. If all you want to do is making predictions for galactic dynamics you don't really need to know just where that modification comes from. All you need is a consistent set of equations. Discrepancies between van Dokkum's measured and McGaugh's estimated dispersion for MOND are at 90% confidence levels. However, since hundreds of galaxies have studied, tens 90% CL deviations have to occur. It's quite stretch for van Dokkum to claim that MOND is ruled out by based on measurements of a single galaxy that differs from MOND estimates at the 90% CL,especially given the large underlying uncertainties that go into the interpretations of the measurements and the OD estimates. "It is beyond me why so many astrophysicists believe that modified gravity is somehow magically different from particle dark matter, or indeed all other theories we have ever heard of. It’s not." I see your point, but expressing it this way hurts more than it helps. In a nutshell, typical modified-gravity theories need new physics, while dark-matter theories don't (except perhaps for the origin of the dark matter, but this is particle physics or whatever, not gravity, and some dark-matter candidates, such as primordial black holes, don't even need this). "But I’m not an astrophysicist, I’m a theorist. I invent equations and then despair over my inability to solve them." I propose a standing ovation for this statement alone. Chapeau! Wasn't it you who pointed out to me what an unfortunate phrase the term "new physics" is? For most people on the planet, GR and quantum mechanics is "new physics." I don't think that I said this about "new physics". There was a similar situation a while back with the solar-neutrino problem. I remember asking John Bahcall about it at a conference on astroparticle physics in Stockholm (1994 I believe): Are the observations wrong, are the models wrong, or is it new physics? He said that it is new physics. He turned out to be right. Why is it a modified gravity and not just the usual gravity plus an additional field? The one you call u. Sorry for the mixup. But whoever said it, I think he or she was right. Calling it "new physics" isn't helpful. Gravity with an additional vector field is modified gravity. If you consider electromagnetic field or perfect fluid (as is done in cosmology), or any number of matter fields in GR, it is not considered modified gravity. So why, when you have the u-field, you called it modified gravity? Sabine, one thing I really appreciate about your writing is that you explain physics more like a mathematician (due to your background). Some physicists seem to want a certain shape of story and then try to make the underlying math fit even if it requires extraordinary assumptions. I know you did not know about Ethan's post. Just coincidence but it does [coincidentally] seem to be written in response to yours..
" All you need is a consistent set of equations. " is Lee Smolin successful in his proposal and if not, what more work need to be done to show MOND is the consequence of quantum gravitational effects? @knobsturner DOI:10.1103/PhysRevLett.117.201101 "fully specified by...the baryons" No other material inputs exist. One errs in demanding them. @Skeptical Cosmologist "you cannot modify GR without adding extra fields" Einstein-Cartan-Kibble-Sciama gravitation. Equivalence Principle violation sources Milgrom acceleration and the cosmological constant by sacrificing "beauty." Lowered vacuum symmetry purchases exact solutions. Maths then follow observed paths rather than suggest infinitely many. @Ian Miller " MOND includes an additional force" Force through distance is work. Constant acceleration FOB is observed. Change the vacuum, selective to hadrons. Physics does not extend beyond its maths. Derived experiments are isolated from solutions. Centrally funded science is a business model excluding risk by prohibiting discovery. If there is no spoon, one need not find it. Chemistry is the empirical study of matter ahead of theory. Find a fork. @Sabine Gravity with an additional vector field is modified gravity Gradient, divergence, and curl. Pseudo/axial vectors. Curve fit at the front end. As I've now said several times, it's not me who coined this terminology, I am merely telling you what is de-facto meant by modified gravity in the literature. Most of modified gravity is general relativity with additional fields. With scalar fields, with vector fields, or with tensor fields, or combinations thereof. Just look at the literature if you don't want to believe it. The only other examples that I know of are either higher-order corrections or non-local modifications, and neither of them, for all I know, gives you a MOND limit. There are of course various other changes to gravity that become important in the UV (such as strings, loops, discretizations, symmetry violations, and things like that), but that's another story entirely. As I said above, the rationale for calling the model I deal with modified gravity is not that it's a vector-field added, but that the effect we assign to dark matter is not caused by gravity, it's caused by a different force. But honestly I don't really care what you want to call it. No, so far he's not successful. But I believe (and really this is only a belief) that what he and Erik Verlinde are doing isn't entirely wrong. They are both trying to explain why the acceleration scale in MOND is close to the (scale associated with) the cosmological constant, and they both try to use the thermal properties of de Sitter space to make that connection, and it kinda seems plausible to me. I can't presently see any way to test this, but the main reason is that neither has a workable theory that could be tested. But, well, let's see how the next years are going. I just thought of a way you can test Smolin's proposal. One way to "test" this theory is if cosmological constant were different, MOND scale of acceleration would be different which would show up on observation attributed to dark matter in galaxy rotation curves. Perhaps the cosmological constant had different values in the remote past, which leads to different predictions for MOND scale of acceleration which leads to different structure formation than the current value for cosmological constant. What more needs to be done for Smolin and Verlinde's proposal to be made workable? After reading the Supplemental information link you added, I can't help but being struck that this paper in Nature was really just a rough draft with some serious problems in it. This illustrates well the virtues of pre-prints over peer review of catching these kinds of problems. No small number of peer reviewers have enough knowledge to catch all of the issues identified in the supplemental. Also, when you just have 10 data points and 1 is an outlier, and you could add 1 more data point with 5-11 more hours of work to a publication headed for two major journals, why the hell don't you do that work and get a better data set in the first place? @UncleAl - " No other material inputs exist. One errs in demanding them." Electrons are one example of another particle "fully specified by...the baryons". ..
MOND's can be characterized by a surface density, which hints at cross-sections. The "goodness" of a theory can be tested by the number of free parameters it needs to explain the observations. How many free parameters in MOND? Is the parameter a physical thing directly observable or is it conceptual that we can only think about? The cosmological constant is, erm, constant. Having said that, both actually refer to the horizon-size which is redshift dependent and you can test that redshift dependence. Which is what my paper is about. You cannot test the "goodness" of a theory by the number of parameters. What matters is the trade-off between parameters and goodness of fit. MOND has one parameter. It also needs an interpolation function. And (says me) you need some way to get rid of it at very low acceleration. In the superfluid model this roughly speaking corresponds to the critical temperature, mass, and coherence length of the fluid. Which again should (in principle) follow from the (full) Lagrangian. what about the casimir effect? doesn't that change value of the cc within the region between the 2 plates? No, the casimir effect does not change the cosmological constant because the cosmological constant is constant. If you want to engage in further speculations about the origin of the MOND acceleration scale, I suggest you do so elsewhere. One way to "test" this theory is if cosmological constant were different, MOND scale of acceleration would be different"
"which would show up on observation attributed to dark matter in galaxy rotation curves." This would mean a large variation, probably larger than has been ruled out by other means. "Perhaps the cosmological constant had different values in the remote past"
As has been pointed out, the cosmological constant is constant, though more-general dark energy doesn't have to be. The point we are trying to get across in the paper is that even if you assume that MOND has a redshift dependence that comes from the change of horizon-size, this dependence is much smaller than what the particle dark matter simulation predicts which we quote in the paper. I don't know how representative this particular simulation is of course. So we're hoping to stimulate others to make predictions for the same observable. The hope is that it's a general effect that particle dark matter leads to a larger redshift-dependence than the MOND(like) limit. What kind of data would be needed to test MOND has a redshift dependence that comes from the change of horizon-size ? How difficult would it be for an astrophysicists to evaluate this ? @Sabine "The distinction between particle dark matter and modified gravity is really more a sociological divide than a mathematical one." I am reminded of something John von Neumann said, "If one has really technically penetrated a subject, things that previously seemed in complete contrast, might be purely mathematical transformations of each other." You need the same data that's in the above plot, with sufficient redshift resolution. You'd have to ask an astrophysicist what that would take. You can introduce as many new degrees of freedom and parameters as you wish. There isn't a priori anything wrong with that and of course new parameters will make better fits. Any sensible statistical analysis should account for this. Dark matter simulations usually don't. *shrugs* We didn't bother in our paper to factor in the number of parameters because there's only one. If you wanted to compare this with a 15+ parameter CDM fit, the latter would receive a huge penalty. Of course the one parameter case that we looked at in the paper is an oversimplified limit, which is also why it's not the greatest fit for the curve. As I mentioned above, the Lagrangian has a total of three parameters and there are a few other parameters that should come in from boundary conditions, symmetry assumptions and so on. Thank you for your refreshing skepticism. Waving my hands here, but it seems like the most obvious difference between NGC 5264-HST and "normal" galaxies is the absence of a gigantic central black hole. Isn't this the first thing we should control for, before we make any statements about the galaxy's dynamics? Maybe there are two kinds of galaxies: objects like NGC 5264-HST in which Newtonian dynamics dominate, and another in which relativistic dynamics dominate, neither of which requires dark matter or MOND to explain stellar motions. That’s precisely how I felt when I read the comment #2, yours to Andrew. I am a reasonably-well-informed layman, nothing more. I have the temperament for physics, but not the math. I heard about the “galaxy without dark matter” and remembering your stated preference for MONDs, I was curious how you’d comment on this report. What I got from that was essentially “it’s too early to tell”. Ok, that’s fair. The Reference Frame accused you of “screaming” in your post, but all I sensed was mild frustration. I don’t usually read the comments afterward, but I did this time. I got to the second one and was gobsmacked. Literally. I actually had to get up and walk it off. Like a lot of people (including commenters here) I understood MONDs as tweaking Newtonian/GR theories of gravitation. Dark matter I understood to be positing a “new thing”; some kind of as-yet unobserved particle. Therefore, the absence of dark matter effects (if confirmed) in any galaxy would seem to confirm that dark matter does exist; where as the laws of physics, being universal, could not allow such an exception. It would be game over, or at least seem so to laypersons such as myself. Maybe it’s my lack of training, but it simply escaped me FOR YEARS that MONDs also posit a “new thing”; but a field instead of a particle. I would feel embarrassed by my ignorance if it weren’t for the fact that it seems that many, many others also missed this; including commenters here, and apparently astrophysicists who should have understood this, and science journalists who are supposed to help inform laypersons like me. Perhaps the reason people keep asking you about things like this is that the lede keeps getting buried. DM and MOND both propose “new things”; the former some kind of Very Elusive Particle; the latter some additional field. MOND does “modify” gravitational effects, but by ADDING something new. Dark matter adds something new which MODIFIES gravitational effects. Six of one, a half-dozen of the other. The naming convention contributes to this for sure; but this is certainly not the first time physics has confused things with a bad term. The whole “naturalness” thing confuses many who think the “naturalness” problem indicates a designed universe. I attribute that to translating a perfectly sensible term from some other language into English. I’d suggest clarifying this matter would be worth a post all by itself. As long as people think that MONDs merely change the formulas a bit, they will not have a clue what they are about. "As I've now said several times, it's not me who coined this terminology, I am merely telling you what is de-facto meant by modified gravity in the literature. Most of modified gravity is general relativity with additional fields. With scalar fields, with vector fields, or with tensor fields, or combinations thereof. Just look at the literature if you don't want to believe it." what adjective or description would you use to describe the class of gravity theories that try to reproduce MOND and GR, by using dark energy, but do NOT introduce additional fields, scalar fields, with vector fields, or with tensor fields, or combinations thereof. While black holes are commonly found in galactic centers, not all galaxies have them. For all I know this isn't correlated with the presence of dark matter. Also note that just because a galaxy has a black hole doesn't mean the dynamics (of the galaxy) becomes relativistic. Really the black hole only affects the dynamics in its immediate environment. And that is typically in the core, which isn't in the MOND regime anyway. We know forces are mediated by fields, and new forces require new fields. It's thus not so surprising (I think) that pretty much all completions of MOND (which make it compatible with general relativity) require new fields. From my side, this comment section has also been insightful for it was not clear to me that this point is not well understood. So, thanks everyone for the feedback. I don't understand the question. What does dark energy have to do with this now? Also, what "class of theories" are you talking about. Can you name at least one member of this class? Perhaps the next turn of the screw will propose a Milgrom acceleration "field" is a dark matter virtual "particle" without acknowledging the unbeautiful screw. 100 story skyscrapers are being constructed starting at their third floors. I don't see that making them taller. these theories are called modified gravity. but what term should be used that attempt to create a theory of gravity that reproduce MOND but does NOT add "additional fields. With scalar fields, with vector fields, or with tensor fields, or combinations thereof" to GR to get MOND. I don't understand why you want to me spend my time coming up with a name for something that to my knowledge doesn't exist. Verlinde and Smolin attempt to reproduce MOND with GR but do not add "additional fields. With scalar fields, with vector fields, or with tensor fields, or combinations thereof". Verlinde calls his ideas emergent gravity which does not add "additional fields. With scalar fields, with vector fields, or with tensor fields", but does give rise to MOND. would it be fair to say there are at least to ways to get MOND from GR, modified gravity which by definition adds additional fields, and emergent gravity, which does not add additional fields. Verlinde adds a vector field, he calls it he "displacement vector". As to Smolin. Well, wait for his next paper. Of course, if all you want is the MOND limit you can do it without additional fields, the same way you can Newtonian gravity without having to talk about the metric. My point is that I do not know any theory of modified gravity (compatible with GR) that works without additional fields. And I have good reasons to think there isn't one. one new theory of gravity that has gotten lots of media coverage, including most recent April 14, 2018 issue of New Scientist page 34 "not quite the theory of everything" is Antoine Tilloy theory of gravity, based on "Ghirardi-Rimini-Weber model with massive flashes" and " Binding quantum matter and space-time, without romanticism "
his theory predicts the Newtonian inverse square law breaks down at atomic scales, which could in principle be tested and falsified. If verified perhaps this could also explain MOND? gravity in his theory is the result of wave function collapse, which gives rise to inverse square law over certain regime and scales, but breaks down, not unlike what MOND posits. he does not add additional vector fields AFAIK. it should be possible to derive MOND from his theory of gravity. his papers considers claims of the need to quantize gravity to be based on mathematical beauty, which kinda sounds familiar, and is shaky. specifically the idea that gravity has to be quantized is an argument from mathematical beauty, he says. in his theory spacetime remains unquantized and classical and GR-like. string theory and LQG are both wrong. I've neither read the paper nor the New Scientist article but GRW is a collapse model. It doesn't help you zip with explaining rotation curves if you have a modification of GR below atomic scales.
" My point is that I do not know any theory of modified gravity (compatible with GR) that works without additional fields. And I have good reasons to think there isn't one." My question is, if all you do is add a field, why is it called modified gravity? It seems just like general relativity with any other field or fields. Unless you modify the part of the Lagrangian that contains the scalar curvature then there is no need to called it modified. You are only changing the matter content, not the law of gravity. Why is it called “Microsoft”? Ehh. Why care? Names like these are often historic artifacts; “MOND” pro’bly made sense once, and the name stuck. Now it’s just the label on the box. What matters is what’s in the box. GR has only one free parameter: G. On the other hand, the initial conditions need an unlimited number of parameters to describe them - because they describe a field. On the third hand, however, once the initial distribution of matter is specified, all the wiggles in space time that you start with will rapidly disappear into the distance as gravitational radiation. This is why GR is a strongly determined theory. For practical purposes you only get gravity where there is matter. This is in contrast with cold dark matter, whose distribution needs to be specified in great detail, and does not necessarily follow that of baryonic matter. So if you add fields to generate modified theories of gravity, do these additional fields resemble standard gravity, which is strongly determined, or cold dark matter particles, which are not? The reason it's called modified gravity is that in these theories the effect we assign to dark matter is *not* caused by the normal gravitational pull. Instead, the new fields induce new long-range forces, which "modify gravity". This is not the case for particle dark matter, where it's the gravitational pull of the additional "stuff" that gives rise to flat rotation curves. As I have said several times already, I am merely telling you how the term is used in the literature. I neither coined it nor do I advocate it. In the end what matters isn't the name but the equations. f(R) modifications don't give you MOND, at least not to my knowledge. As I said above, higher order corrections in the curvature become relevant in entirely the wrong limit. GR has two free parameters, G and the cosmological constant. The type of equations (as with coupled hyperbolic differential equations) is the same for particle dark matter and modified gravity, though the equations for modified gravity tend to be considerably more complicated because of the way the fields couple. In both cases you can (but you shouldn't) pick initial conditions as you please. The relevant difference doesn't comes from the initial conditions but from the requirement of reaching a quasi-equilibrium because the present day is late times in the game. As I have noticed above, you can always come up with exceptions to the rule by just assuming stuff to be where you want it to be. What you cannot fiddle with, however, is how the situation will evolve from some initial conditions. Now if you have a different long-range force the new fields will evolve towards different equilibrium configurations than what you get in the absence of that force. Generically the latter will allow for a much larger variety of solutions. That the new long-range force creates new regularities is what give rise to the MOND-effects. I do understand that you didn't coin the term, and I don't claim that. At the same time when you write a paper or a blogpost you choose the wording and the naming. You can easily say I have written a paper where I consider the effects of such and such field on the motion of so and so particles. Instead you write that you are a proud owner of a modified gravity theory. Now I am a very cynical man and cannot help but think that calling it modified gravity makes it look somehow better, and doesn't require any explanation about the nature of the field. If you say that you are simply studying GR with a certain matter model, well it is not as grand and you need to justify why you suspect that such matter may exist. Let's put aside my cynicism and try to be objective. I do get that you want to make it clear that it is different than some type of particle dark matter. I also understand that you are following a somewhat accepted nomenclature in the field. But still why not call it what it is? Why use inaccurate (in fact wrong) and misleading terminology? For instance long range non-gravitational forces are not modification of gravity, they are non-gravitational forces! As you note, I am following the standard nomenclature. If you want to revolutionize that standard, you're welcome, but I don't think it's a fight worth my time. As I said several times already, what matters are the equations, not what they're called. Sabine, this is a bit off topic, but I noticed that you are on the list for "Honorable Mention" at the Gravity Research Foundation 2018 awards in Wellesley, Massachusetts. Did your paper cover your recent "Covariant Emergent Gravity" theory, and would you be planning to publish this paper on the arXiv, or someplace else? As a little trivia, I happened to walk by one the the Gravity Research Foundation's fifteen monuments spread across the United States, on the Keene State, New Hampshire, college campus a couple months ago. I read the inscription, but don't recall the wording. The paper is on the arXiv, it's this one. This is an old topic, but there are new findings.